A shifting sequence of media reports, official statements and even a presidential tweet have put a spotlight on Foxconn's changing focus and what it means for Wisconsin's historic public investment in the project. While uncertainty has grown over the type of facility the Taiwan-based electronics giant will build and the workforce it will hire, the company's plans as of February 2019 call for a Gen 6 facility, which would fabricate LCD screens much smaller than those originally planned. Meanwhile, one major aspect of Foxconn's Wisconsin endeavor that is so far unchanged since summer 2018 is a municipal water and sewer infrastructure build-out for its Mount Pleasant campus. To date, the village and adjacent city of Racine have awarded at least seven contracts for water and sewer infrastructure work associated with the Foxconn "project area," Claude Lois told WisContext via an email sent on his behalf by Mueller Communications, a public relations firm. Lois directs the Foxconn project for the village of Mount Pleasant. "Work associated with awarded contracts has begun and continues on schedule," he said. The Wisconsin Economic Development Corporation, which negotiated the specific terms of the $3 billion state incentive package to land Foxconn and its promised $10 billion investment, tallies eight contracts awarded for water and sewer infrastructure upgrades related to the project and adjacent development. Three of those projects were completed as of early February 2019, according to WEDC, while most of the remaining contract work is scheduled to wrap up between March and August. Keith Haas, general manager of the Racine Water Utility, told WisContext in an email that he did not know whether the water infrastructure plan would change. "We are building the project to meet Mount Pleasant's needs," Haas said. "I hope to hear something in the coming weeks if there are any changes." The infrastructure under construction is a network of new water mains and sewers that will serve the Foxconn site. The company's original plan to build a massive complex for manufacturing large LCD screens would have required an enormous volume of water. To meet Foxconn's expected needs, Mount Pleasant and Racine received approval from the Wisconsin Department of Natural Resources in April 2018 to draw up to 7 million gallons of water per day from nearby Lake Michigan. 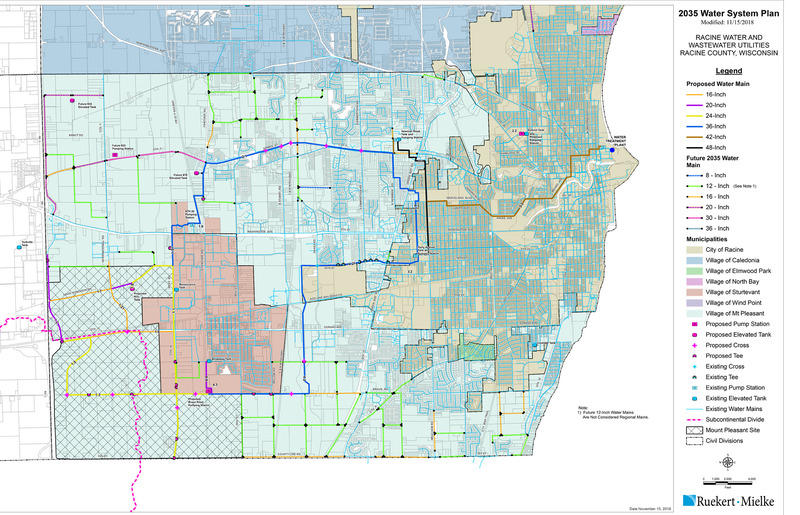 A November 2018 map of water infrastructure improvements in Racine and Mount Pleasant shows existing and proposed structures. Racine needed the DNR's approval per the rules set out in the Great Lakes Compact, a 2008 agreement between the eight states — Illinois, Indiana, Michigan, Minnesota, New York, Ohio, Pennsylvania and Wisconsin — within the Great Lakes Basin. The Compact regulates the use of Great Lakes water, including constraints on diverting water outside of the certain boundaries. The DNR's approval of Racine's plan to divert water to Mount Pleasant faces legal challenges given the involvement of Foxconn. An environmental law group filed a lawsuit seeking to overturn the approval, and Gov. Tony Evers has announced a review of the approval process. In June 2018, Foxconn announced it would install a water recycling system at the Mount Pleasant site that would limit its water use to 2.5 millions gallons per day. And just a few days later, Racine awarded its first bids to build the infrastructure needed to pump water from Lake Michigan to the Foxconn campus. At that time, Foxconn also changed its original plans to manufacture large LCD displays for televisions and announced it would be making smaller screens used for phones, laptops and smaller TVs. One analyst said the water requirements of a Gen 6 plant — the type that would manufacture smaller screens — are far below the infrastructure's apparent capacity, as well as Foxconn's permitted daily use. David Hsieh is a Taipei-based senior analyst at the global market, industry and technology information firm IHS Markit, and previously worked as a production planner for multiple LCD manufacturers in Asia. Hsieh shared an analysis by IHS Market estimating that a Gen 6 facility at Mount Pleasant would require about 1.4 million gallons per day, a volume far smaller than the DNR's approved amount of 7 million gallons. A schematic shows the flow of water in an LCD screen manufacturing facility. That's also more than a million gallons lower than the maximum daily amount Foxconn would need with a water recycling system. When uncertainty about Foxconn's plans erupted at the end of January 2019, Midwest Environmental Advocates, the law group challenging the DNR's diversion approval, contended that the water diversion would no longer be necessary. Still, Racine's and Mount Pleasant's water infrastructure plans remain what they were in June 2018. Lois said the infrastructure that's been built and still under construction would be necessary no matter what Foxconn builds on the site. "In order for the project area to be developable, for any use, key utilities had to be extended to the development area," Lois said. "There has been no change in those needs, and infrastructure improvements continue as originally planned. "We are in regular, weekly communication with Foxconn officials," he added.